The Blackberry Jack is located two and a half miles north of St Albans city centre in the Jersey Farm estate. It was built in the 1970's soon after all the surrounding houses were built. This is quite a large pub with a conservatory to one side and a few outside tables. The conservatory appears to be used mainly as a dining area and had around eight tables in it. On the other side of the pub is a raised area that hosts a pool table and a dartboard. 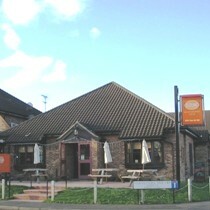 The pub is part of the Sizzling Pub Company chain of pubs owned by Mitchells and Butlers. The steaks are excellent and good value - I had an 8oz sirloin steak with chips for less than £7. Unfortunately the only real ale normally available, London Pride, was temporarily unavailable at the time of the review so I had to settle for a pint of Stella. London Pride is a regular ale at the Blackberry Jack as I have drunk it before on previous visits. Considering the visit was fairly early in the evening the pub was reasonably busy (I waited quite a while before getting served) with a good mix of people. Typical of an estate pub most people seemed to know each other. The Blackberry Jack is a modern pub with a smart interior and good value food. Atmosphere is quite friendly with most drinkers walking from the local Jersey Farm estate.